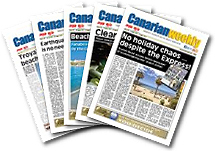 Oasis Fm's programmes are produced and hosted by our team of presenters based here in Tenerife . We have a core base of permanent presenters, supplemented at times by additional freelance and relief presenters who cover holidays, sickness and some weekend programmes. The Oasis Fm website includes a section with full details of all the current members of our presentation team. For full details choose 'DJs/presenters' from the menu on the left side of the page.. Details of the programme we are currently transmitting are displayed continuously on the left hand section of this website. A full schedule of our programmes for each day of the week can also be found by selecting the 'schedule' section of the site from the main menu. All of Oasis Fm's prime time programmes, from 08.00 – 23.00, are produced and presented from our studio's in Las Chafiras, we don't broadcast programmes produced by other radio stations, nor does it share its programmes with any other station. Some of our programmes, mainly at off peak times, are pre-recorded or automated - but all are produced by our in-house team, with the exception of content supplied under license from the Ministry of Sound and the UK Top 20 Rewinds. As much as it is possible to do so for a station the size of Oasis Fm, we aim to reflect the area we serve throughout our programming.